Episode 64 - Quinn Hargitai Quinn Hargitai is a teacher, writer, photographer, and Returned Peace Corps Volunteer, in no particular order. After living and working in Albania for two and a half years, Quinn returned stateside and began working as a teacher at an international school in the greater New York area. In addition to his work in education, Quinn writes stories for outlets such as BBC Travel and BBC Culture. Right now, he makes up one third of the team at Bright Side, a website dedicated to highlighting immigrants who have come to the United States to pursue the careers in the creative arts (www.thebrightside.co/). 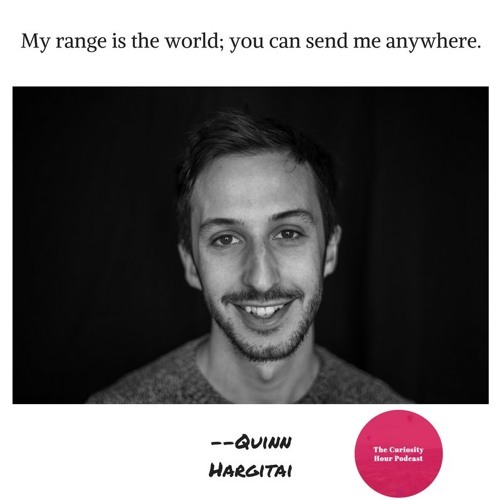 With an avid admiration and respect for the diverse cultures of the world, Quinn has made a life out of exploring new frontiers, and his philosophy of always asking himself "Why not?" has brought him everywhere from Beijing to Istanbul. Note: guests create their own bio description for each episode. The Curiosity Hour Podcast is hosted and produced by Dan Sterenchuk and Tommy Estlund. Please visit our website for more information: thecuriosityhourpodcast.com Please visit this page for information where you can listen to our podcast: thecuriosityhourpodcast.com/listen/ If you would like to share your story or have a suggested guest, please complete the "Contact us" form: thecuriosityhourpodcast.com/contact-us/ Disclaimers: The Curiosity Hour Podcast may contain content not suitable for all audiences. Listener discretion advised. The views and opinions expressed by the guests on this podcast are solely those of the guest(s). These views and opinions do not necessarily represent those of The Curiosity Hour Podcast. This podcast may contain explicit language.